Our fundamental principle is The only way to solve a difficult problem is to resolve its root causes. Accordingly, root cause analysis is the first of the three main tools in our approach to solving difficult social problems. The diagram explains how the three tools work together. 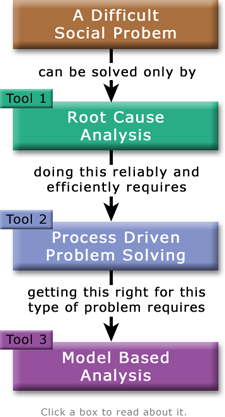 A high quality root cause analysis can't be done without using a root cause oriented process, which in turn can't be done well without model based analysis. Tool 3 thus magnifies the power of Tool 2, which magnifies the power of Tool 1. "There are a thousand hacking at the branches of evil for one who is striking at the root, and it may be that he who bestows the largest amount of time and money on the needy is doing the most by his mode of life to produce that misery which he strives in vain to relieve." In other words, giving time and money to the needy does not resolve the root cause of their plight. It may even make the problem worse. THE strategic reason popular solutions to the sustainability problem are failing is they do not resolve root causes. Given the principle that all problems arise from their root causes, no other explanation is possible because we've seen millions of activists working on the problem for over forty years. Popular solutions have made a small difference. Many small local successes have occurred. We've even had one international success: solving the stratospheric ozone layer problem. Overall, however, we've been winning battles but losing the war. This insight holds for all types of problems that have gone unsolved for generations and where multitudes of solution strategies have been tried by brilliant and dedicated activists. Let's examine how this insight explains problem solving behavior at the macro level. Classic Activism is the problem solving process used by over 90% of activists (including organizations) working on the sustainability problem and other problems whose solution would benefit the common good. The rest use comparative analysis or superfluous academicism. See the three chapters on these three processes in Common Property Rights: A Process Driven Approach to Solving the Complete Sustainability Problem. Since the most popular process is Classic Activism, let's examine it through the lens of the above insight. 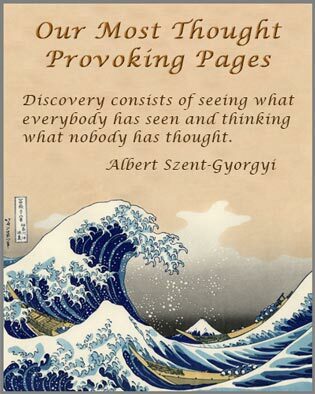 Let's see how much further understanding we can glean from the insight. When a solution fails, classic activists assume they failed because they didn't get the truth across somehow. They didn't inspire enough people, or reach enough people with their message, or bargain correctly with stakeholders, or manage solution implementation correctly, and so forth. So they try the same types of solutions again but this time somehow different and better. They redouble their efforts to find the truth, promote the truth, and amplify the truth. When this too fails classic activists have no idea what to do next, so they repeat the above strategies with even more vigor and permutations or gradually give up. There is, however, a completely different way for activists to look at their problems and solutions. This requires stepping through the door into a new paradigm. This is the world of complex social systems. These systems are populated by intelligent social agents with goals, constraints, assets, habits, and so on. At the heart of this paradigm lies the abstraction of systemic change resistance and the use of root cause analysis. If change resistance is low, ClassicActivism works quickly. It took only about ten years to solve the stratospheric ozone hole problem. If change resistance is medium, Classic Activism works but takes awhile. It took about 50 to 100 years to solve the women's suffrage problem in Western nations. It took centuries to solve the slavery problem and about 50 to 100 years to solve the subsequent civil rights problem. If change resistance is high, Classic Activism never works. The problem is never solved, as in the environmental sustainability problem, the recurring wars and recessions problems, the institutional poverty problem, and the excessive income inequality problem. If change resistance is high and root causes analysis is not used, solutions invariably can't solve the change resistance subproblem. Since they can't solve that they can't solve the proper coupling subproblem, which is what most people consider the real problem to solve. For example in the environmental sustainability problem, the economic system is improperly coupled to the environment. Their relationship is unsustainable. Click the diagram to see the causal chain present in all problems. Click it again to hide the chain. The chain runs from root causes up to intermediate causes and then on up to symptoms. This is the universal chain of cause and effect. It's everywhere because a system's many causal chains determine its behavior. 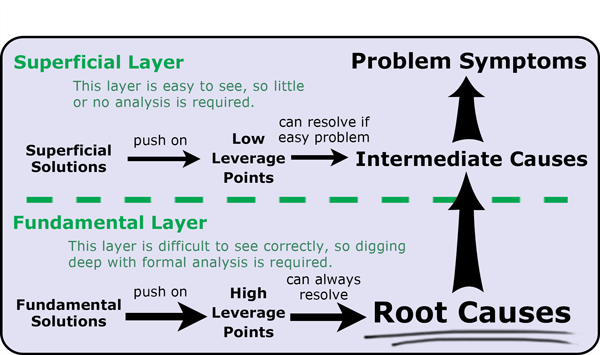 The immense challenge facing problem solvers is seeing what's below the superficial layer. What's in the superficial layer is easy to see. No analysis is necessary to find the intermediate causes and their solutions. But these are superficial because they don't go deep enough. They don't resolve the root causes. To do that one must penetrate to the fundamental layer. This is extremely difficult to see so it requires analysis, which leads to the root causes and then to the fundamental solutions for resolving the root causes. Thus solving the problem requires seeing the causal chain that runs from fundamental solutions to root causes to intermediate causes to problem symptoms. That's how root cause analysis works. One symptom of the sustainability problem is climate change. The main intermediate cause is too much greenhouse gas emissions. So what's the solution? If that's the cause, then the solution is obvious. It's mandatory limits on emissions or carbon taxes. But why hasn't that worked? Because the root causes are not being resolved. 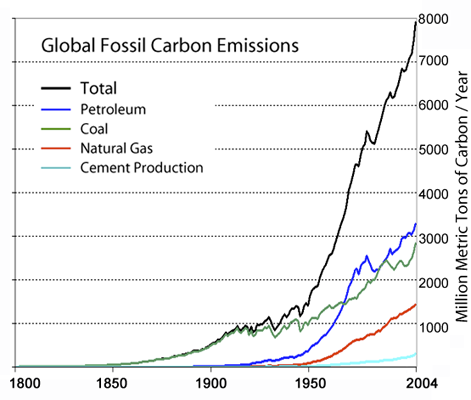 What's the deeper cause of too much greenhouse gas emissions? The standard answer is externalized costs. This means it's cheaper to pollute than not to. Why is it cheaper? Because there are no laws internalizing the costs into market transactions, like emission limits or a carbon tax would do. This explains the great popularity of emission limits and carbon taxes. Those promoting popular solutions have been hacking at the branches of evil instead of striking at the root. How can we strike at the root? With root cause analysis. Why is the world dragging its feet? Because of systemic change resistance. Until that is overcome there will be only modest progress in adopting popular solutions like mandatory limits and carbon taxes. That's why the sustainability problem needs to be subdivided into subproblems, the most important being: How to overcome change resistance? The root cause of change resistance needs to be found and fixed. Only after that will the system "want" to accept solutions like the Kyoto Protocol on climate change and carbon taxes. But the environmental movement is not treating change resistance as a distinct and separate problem to solve. Instead, it's using inspiration, exhortation, and bargaining to try to get solutions adopted. This is step four of Classic Activism. 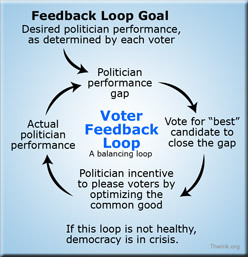 If classic activists switched to a process that was driven by root cause analysis and treated change resistance as a separate problem, then it would not be long before the above graph took a more pleasant turn downward. The analysis at Thwink.org found four main root causes of the environmental sustainability problem. Finding them took about seven years, due to the extreme difficulty of the problem and the need to simultaneously develop a suitable process. The contents of this table demonstrate how a well conceived root cause analysis can cut through the toughest of problems and reveal new insights that can lead to novel solutions that have not been considered. The hard part was finding the root causes. Everything else after that followed easily. The Summary of Analysis is presented at the high level in Analysis of the Sustainability Problem. 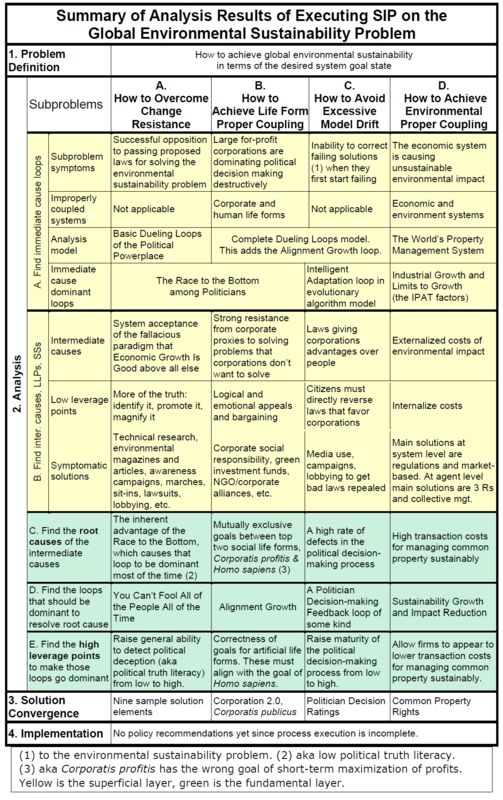 For the full analysis and the model behind it see Common Property Rights: A Process Driven Approach to Solving the Sustainability Problem. (1) Definition from Wikipedia on October 24, 2011. Most material covers root cause analysis from the viewpoint of technical problems, like those in manufacturing and accidents. The concept, however, is very applicable to social problems. “The Rogers Commission study of the Space Shuttle Challenger accident concluded that the root cause of the accident was an accumulation of organizational problems. That's how hard it is to fix root causes for difficult social problems. This explains why a formal process that fits the sustainability problem is required. 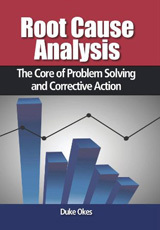 Performing root cause analysis reliably and efficiently, which includes the solution working well over a long period of time, requires process driven problem solving.